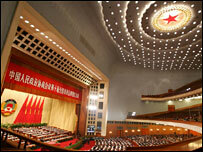 China has unveiled a landmark law that will boost the protection of private property rights. This is the first piece of legislation in the Communist country to cover an individual's right to own assets. Analysts say the move is an important step away from Chinese egalitarianism and towards a market economy. The bill will also reportedly boost protection against land seizures, which have become a major source of unrest among farmers in rural areas. Introducing the law to the annual session of China's legislature - the National People's Congress (NPC) - Deputy Chairman Wang Zhaoguo said the country's economic and social changes made the proposed legislation necessary. It will help "safeguard the immediate interests of the people", he told reporters. With the economy becoming increasingly dependent on private investment, China's people "urgently require effective protection of their own lawful property accumulated through hard work," he said. China's leaders have been struggling for decades to enact a law to cover private assets. A similar bill was taken off parliament's agenda last year, after critics warned that it would worsen social inequalities and promote the sell-off of state assets by unscrupulous officials. Others feared it would erode China's socialist principles. The latest text of the bills states that: "The property of the state, the collective, the individual and other obligees is protected by law, and no units or individuals may infringe upon it." But it adds that: "The nation is in the first stage of socialism and should stick to the basic economic system in which public ownership predominates, co-existing with other kinds of ownership." The bills also seeks to address the, often illegal, land seizures that are taking place, and the government transfer of farmland to developers, frequently without farmers being given adequate compensation. 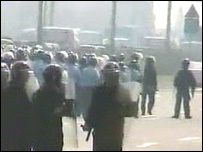 The problem is a common cause of unrest in the countryside. The bill is set to pass next week at the close of the NPC session, which mainly serves as a rubber stamp to endorse the policies of the ruling Communist Party.